Introduction: The definition of each uroflow pattern is vague, and therefore, interpreting uroflowmetry curves is associated with low inter-rater agreement. The aim of the study is to evaluate whether subjective or objective parameters could better differentiate tower from bell curves. Materials and Methods: Uroflow curves of community healthy adolescents with smooth continuous curves and minimal fluctuations within optimal bladder volume were independent reviewed by two experienced pediatric urodynamists and classified as bell or tower. The objective parameters generated from uroflow curves including Franco-Yang (F-Y) index (≧80) and angle at peak flow rate (A_Qmax ≧80°) were also used to differentiate tower from bell. The participants were asked to complete dysfunctional voiding symptom score (10 items, score 0–3). Results: A total of 287 adolescents with a mean age of 15.3 ± 1.7 years were enrolled and 150 curves were eligible for analysis. The inter-rater agreement was low (kappa = 0.27). Adolescents with uroflow curves classified as tower though F-Y index and A_Qmax were associated with higher urgency score than those with bell curves. However, adolescents with the tower curves defined by interpreters did not have higher urgency scores. Conclusions: Objective classification of tower curves with may be more reliable than subjective classification by the urodynamists. However, a significant proportion of participants with tower curves did not have urgency symptoms. The International Children's Continence Society and the International Continence Society defined each uroflow pattern in words' description without using objective parameters.,, Therefore, interpreting uroflowmetry curves is more of an art than science which is subjective to interpreter's experience and is associated with low inter-rater and intra-rater agreement.,,, To overcome this problem, several approaches have been made including the recently published Franco-Yang flow index (F-Y FI). The F-Y index intended to classify bell, tower, and plateau curves with numerical parameters generated from the uroflowmetry with reported good reliability. 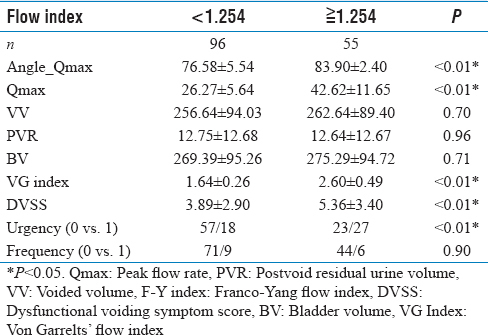 Possible weakness of F-Y FI is that the classification of uroflow patterns was made after two urodynamists' agreement which may include equivocal flow curves. The study design was also lacking of gold standard that could validate the method. Therefore, we used only the smooth, continuous curves with minimal fluctuations, i.e., typical bell and tower curves to check whether subjective interpretation by experienced urodynamists or objective parameters, i.e., F-Y FIs, could better differentiate tower from bell curves. The study was approved by the ethical committee of our institute. Two experienced urologists (Y and C) independently reviewed uroflowmetry curves of healthy adolescents enrolled from junior and senior high schools in Xindian, New Taipei, Taiwan. The research model has been successfully conducted in children. Adolescents with known congenital genitourinary tract anomaly, neurological disorders, or history of urinary tract infection (UTI) were excluded from analysis along with those with UTI or asymptomatic bacteriuria, positive leukocyte esterase or nitrite on urinary dipstick tests. Uroflowmeters (UFM Master1, MMS, Netherlands) were set up in the school toilets. The adolescents were requested to perform one or more sets of uroflowmetry and postvoid residuals (PVRs). A study nurse was available to instruct the individual on how to perform the test appropriately and to encourage fluid intake when necessary if the individual did not appear to be adequately hydrated. The males voided in a standing position and the females in a sitting position with adequate foot support. All PVRs were obtained on the same day and assessed within 5 min after voiding with suprapubic ultrasound (Logiq Book1, GE Medical Systems, Milwaukee, WI) and estimated by the equation of height × width × depth × 0.52 ml. Bladder volume is defined as “voided volume + PVR.” Each individual was asked to answer and complete the dysfunctional voiding symptoms score (DVSS) and daily urinary frequency. Urgency was defined as urgency score ≥2, whereas frequency was defined as voiding frequency ≥8 times a day. Only smooth continuous curves with minimal variation of flow rate (fluctuations with drop >2 ml/s), i.e., the curves look like typically bell or tower, were enrolled for analysis. Because over-distended bladder and small voided volume may compromise the interpretation results, only the curves within optimal bladder volume (OBV), i.e., between 110 and 500 ml, were considered eligible for interpretation. Main curve percentage (MCP) is defined as area under main curve/area under all curves × 100% [Figure 1]a. Bell curve is defined as smooth continuous curve with bladder volume at OBV, MCP >95%, no sudden drop >2 ml/s, and peak flow rate (Qmax) >15.0 ml/s. Angle at Qmax (A_Qmax) is defined as the angle between Qmax and time to Qmax [Figure 1]b.
Uroflowmetry curves that looked like “bell” pattern but associated with significant fluctuations [Figure 2]a and [Figure 2]b were excluded from analysis. Smooth continuous curves with a bladder volume >500 ml or <110 ml were also excluded. The inter-observer agreement was analyzed using kappa statistics and the grade of agreement was classified as Altman's suggestion. Data were expressed as means ± standard deviation and were analyzed by commercial statistical software (Medcalc, version 9.3, USA). Demographics, urgency rate, DVSS, and uroflowmetery parameters between tower and bell were compared via an independent sample t-test (continuous demographic variables) and Chi-square test (nominal data). A P < 0.05 was considered statistically significant. We enrolled a total of 287 adolescents with a mean age of 15.3 ± 1.7 years (range 12–18 years) and a male to female of 121:166. Ninety-three adolescents had a second set of study. Excluded from the following analysis were 42 curves with a bladder volume >500 ml, 39 curves with a bladder volume <110 ml, and 149 bell-like curves. The parameters of the remaining 150 (39.5%) curves within OBV and without artifact are listed in [Table 1]. The included uroflow curves from girls had higher Qmax, F-Y index, and Angle_Qmax (P < 0.01). Of the 119 curves (79.3%) that were read as bell by both urologists (BB curves), 24 were considered (16.0%) as bell by Y and tower by C (BT curves), 1 (0.7%) as tower by Y and bell by C (TB curve), and 6 (4.0%) as tower by both (TT curves). The inter-rater agreement between the two observers was low (kappa = 0.27). [Table 2] summarizes the objective and subjective parameters of subjective bell and tower curves. As expected, mean Qmax was lowest in BB curves (BB vs. BT vs. TT = 28.30 ± 7.03 vs. 44.66 ± 8.15 vs. 59.80 ± 20.54 ml/s, P < 0.001). There was no significant difference between voided volume, PVR, and bladder volume. DVSS was highest in children with BT curves (BB vs. BT vs. TT = 3.73 ± 3.04 vs. 6.00 ± 3.76 vs. 4.67 ± 2.50, P < 0.0001). Rate of urgency score ≥2 or frequency ≥8 times per day was not significantly different between children with BB and BT curves. F-Y indexes were lowest in BB curves and highest in TT curves. Wide range of A_Qmax in BB curves was noted (55.3°–85.9°), and 48 (40.7%) BB curves had an A_Qmax >80°. Range of A_Qmax of BT curves was 80.1°–87.0°. F-Y FI was examined according to the suggested cutoff points in males and females. Curves with a F-Y FI ≧1.254 had significantly higher Qmax, A_Qmax, and rate of urgency [Table 3]. Since an A_Qmax ≧80° was possibly regarded as tower, we arbitrarily defined bell and tower curves as rising angle <80°and ≥80°. [Table 4] summarizes subjective and objective parameters of this novel classification of bell and tower curves. Compared to tower curves, bell curves had significantly lower Qmax and F-Y FIs (P < 0.0001). 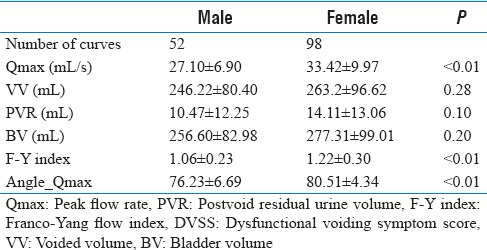 There was no significant difference between voided volume, PVR, and bladder volume. There was significantly higher rate of urgency in the children with tower curves (P = 0.01) than those with bell curves. However, there was no significant difference in the rate of frequency (P = 0.8521). Despite the fact that the two experienced urologists have been working together extensively for >10 years, visual interpretation of bell versus tower curves remained subjective with a low inter-rater agreement (kappa = 0.27). Furthermore, the tower curves classified as tower through subjective interpretation did not higher urgency score. The F-Y indexes and A_Qmax ≧80° may help define bell and tower curves, and higher DVSS and urgency score were noted in the tower curves identified through these objective parameters. Using only smooth continuous uroflowmetry curves at OBV may avoid interference of important parameters, such as peak flow rate and flow pattern. 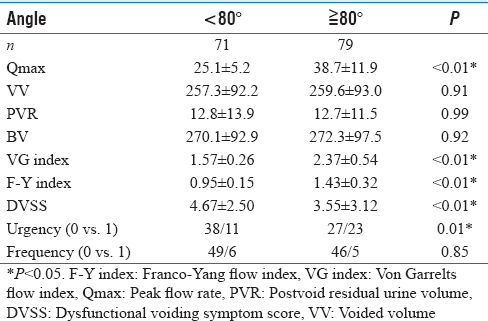 At bladder over-distention, Yang and Chang had disclosed that flow pattern changed, PVR increased, and Qmax decreased in children. While under optimal bladder capacity (OBC), Qmax was lower than those at OBC. Up to date, there is no definition of OBC in adolescents. According to the Chang and Yang's equation for lower margin of OBC, i.e., (age in years) × 5 + 50 ml, the suggested lower margin of OBC for the youngest subjects at 12 years of age will be 110 ml. The upper margin of OBC was never defined either. We arbitrarily defined upper margin of OBV as 500 ml in adolescents because the oldest subjects was 16 years of age and the expected bladder capacity will be 510 ml. Excluding bell-like curves from further analysis may provide a homogeneous group to get better insights of bell and tower curves. 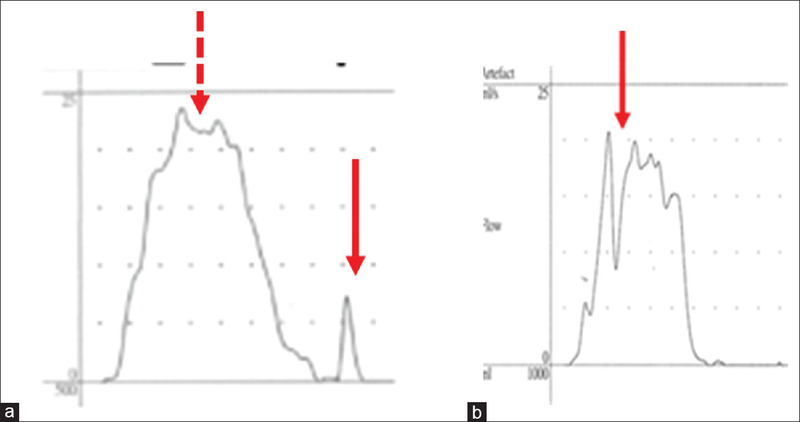 As shown in the [Figure 2], the Qmax, voided volume, voiding time, and flow time shown automatically in the uroflowmeter may not represent the real values required for the subsequent analysis. FI may help define objective classification of bell and tower uroflowmetry curves. Von Garrelts was the first to introduce the concept of FI to ameliorate the effect of bladder volume on flow rate. Franco et al. used a large scale of uroflowmetry curves from 1124 healthy children to establish a new flow index with intent to classify bell, tower, and plateau uroflowmetry curves objectively. These findings challenged the practical use of FI in the differentiation of bell and tower curves. Suggested cutoff points to differentiate bell from tower curves were examined. The index yielded good reliability. Children with higher F-Y FI (≧1.254) were associated with higher DVSS and rate of urgency [54.0% vs. 24.0%, [Table 3]. However, about half of the children with an F-Y FI ≧1.254 were not associated with urgency. A_Qmax of a main curve [Figure 1] ≧80° was proposed to objectively guide the differentiation of bell from tower curves. It seemed logical and adherent to the original idea that tower curves are steeper than bell curves. This novel classification method is partly supported by the results that statistically higher rate of urgency was observed in adolescents with objective tower than bell curves [46.0% vs. 22.4%, [Table 4]. However, more than half of the children with objective tower curves were not associated with urgency. A_Qmax may be just an arbitrary cutoff point to fit the traditional idea of bell versus tower curves and its clinical usefulness is unknown. To enhance the association “tower” curves to overactive bladder or detrusor overactivity, other objective parameters such as bladder volume may be required. High rates of tower curves in subjective interpretation (4.7%–20.0%) or objective classification [46%–54%, [Table 3] and [Table 4] of uroflowmetry curves in healthy adolescents raise the necessity in differentiating bell from tower curves. Furthermore, only around half of adolescents with objective tower curves were associated with urgency [Table 2], [Table 3], [Table 4]. More than half of them with tower curves did not have urgency at all. Therefore, tower curves itself may not stand as a diagnosis of OAB. There were limitations of the study. First, we did not correlate uroflowmetry results with urodynamic studies. Relationship between detrusor overactivity and tower curves in adolescents was unknown. However, invasive study is not possible in epidemiological survey. The study was done in one city. Whether such results can be applied to the other ethnics or the other cities or countries is unknown. Finally, we did not have the data regarding the bladder diary which is an important during evaluation of lower urinary tract function. Objective classification of tower curves with may be more reliable than subjective classification by the urodynamists. However, a significant proportion of participants with tower curves did not have urgency symptoms. The study was supported by Buddhist Tzu Chi General Hospital (TCRD-TPE-104-C1-1). Abrams P, Cardozo L, Fall M, Griffiths D, Rosier P, Ulmsten U, et al. The standardisation of terminology in lower urinary tract function: Report from the Standardisation Sub-Committee of the International Continence Society. Urology 2003;61:37-49. Austin PF, Bauer SB, Bower W, Chase J, Franco I, Hoebeke P, et al. The standardization of terminology of lower urinary tract function in children and adolescents: Update report from the Standardization Committee of the International Children's Continence Society. Neurourol Urodyn 2016;35:471-81. Nevéus T, von Gontard A, Hoebeke P, Hjälmås K, Bauer S, Bower W, et al. The standardization of terminology of lower urinary tract function in children and adolescents: Report from the Standardisation Committee of the International 'Continence Society. J Urol 2006;176:314-24. Gacci M, Del Popolo G, Artibani W, Tubaro A, Palli D, Vittori G, et al. Visual assessment of uroflowmetry curves: Description and interpretation by urodynamists. World J Urol 2007;25:333-7. Kanematsu A, Johnin K, Yoshimura K, Okubo K, Aoki K, Watanabe M, et al. Objective patterning of uroflowmetry curves in children with daytime and nighttime wetting. J Urol 2010;184:1674-9. Liu YB, Yang SS, Hsieh CH, Lin CD, Chang SJ. Inter-observer, intra-observer and intra-individual reliability of uroflowmetry tests in aged men: A Generalizability theory approach. Low Urin Tract Symptoms 2014;6:76-80. Chang SJ, Yang SS. Inter-observer and intra-observer agreement on interpretation of uroflowmetry curves of kindergarten children. J Pediatr Urol 2008;4:422-7. Franco I, Shei-Dei Yang S, Chang SJ, Nussenblatt B, Franco JA. A quantitative approach to the interpretation of uroflowmetry in children. Neurourol Urodyn 2016;35:836-46. Franco I, Franco J, Lee YS, Choi EK, Han SW. Can a quantitative means be used to predict flow patterns: Agreement between visual inspection vs. flow index derived flow patterns. J Pediatr Urol 2016;12:218.e1-8. Chang SJ, Chiang IN, Hsieh CH, Lin CD, Yang SS. Age – And gender-specific nomograms for single and dual post-void residual urine in healthy children. Neurourol Urodyn 2013;32:1014-8. Chang SJ, Chen TH, Su CC, Yang SS. Exploratory factory analysis and predicted probabilities of a Chinese version of dysfunctional voiding symptom score (DVSS) questionnaire. Neurourol Urodyn 2012;31:1247-51. Yang SS, Chang SJ. The effects of bladder over distention on voiding function in kindergarteners. J Urol 2008;180:2177-82. Chang SJ, Chen JY, Chiang IN, Yang SS. Lowest acceptable bladder capacity for interpretation of uroflowmetry tests in children. Low Urin Tract Symptoms 2017;9:161-5. Von Garrelts B. Micturition in the normal male. Acta Chir Scand 1958;114:197-210. Chou TP, Gorton E, Stanton SL, Atherton M, Baessler K, Rienhardt G, et al. Can uroflowmetry patterns in women be reliably interpreted? Int Urogynecol J Pelvic Floor Dysfunct 2000;11:142-7.